1.00 SCOPE: This is a Manufacturer’s Specification on the Playground version of the VITRITURF System. 1.01 DESCRIPTION: Provide all labor, materials and equipment necessary to install the VITRITURF System. 1. VITRITURF shall have marketed this system in the United States for at least five years. a. VITRITURF SE System is utilized wherever an impact, absorbing cushioned surface is required. Playground areas should meet criteria set by the CPSC. a. Check application manual for specific instructions on substrate. 3. Acceptable Substrates for the VITRITURF System include asphalt. concrete and compacted stone. 4. Other Substrates shall be approved by VITRITURF prior to application. 5. The Trained Applicator shall verify that the proposed Substrate is acceptable with application of the VITRITURF System. 6. Substrate Systems shall be engineered with regard to structural performance. 7. Follow VITRITURF’s published details with specific recommendations for this project. A. 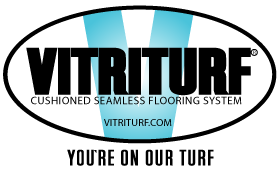 Trained Applicator shall submit 2′ (610mm) x 4′ 1220mm) samples of the VITRITURF System. A. Deliver all materials in original unopened packages with labels intact. B. Store all materials protected from weather and at temperature not less than 40 F (4 C). A. Ambient air temperature shall be 40 F (4 C) at the time of installation of the VITRITURF System. The System may be installed with temperatures below 40. The temperature only affects the system in workability of the materials and the dry time. The lower the temperature, the thicker the viscosity of the binder and the dry time may become delayed without any detrimental affects to the system. B. Adjacent materials and the VITRITURF System shall be protected during installation while curing and/or unattended from weather and other damage. A. Systems to be considered equal to those specified herein shall be approved by then Architect, in writing, at least ten working days prior to the project bid date. 2.01 GENERAL: All components of the VITRITURF System shall be obtained from VITRITURF or its authorized distributors. No substitutions of, or additions of, other materials shall be submitted without prior written permission from VITRITURF. A. VITRITURF Primer: A single component moisture cured polyurethane primer. A1. VITRITURF Under Water Primer: A two component trowelled on primer. B. BINDER: Elastic Polyurethane Pre-Polymer, MDI based. Extremely low odor, capable of excellent weathering and binding characteristics. Binder shall contain no TDI Monomers. 1. Shall be cryogenically processed. 2. Shall be chopped to 1-3mm or 3/8″ shredded granules and contain less than 4% dust. 3. Shall be packed in suitable bags to protect SBR from moisture. D. VITRITURF EPDM Rubber: A man-made rubber containing minimum of 30% EPDM and having a density of 1.5-0.05. 1. Is available in assorted colors. 2. Is available in three sizes: 1-3mm, and 0.5-1.5mm. E. VITRITURF SE: A mixture of SE Binder and man made Rubber Grout. The SE may be applied directly over the VITRITURF BASE MAT or over the VITRITURF WEARING COURSE (MULTIPURPOSE SYSTEM) depending on the desired effect of the system. 1. Shall have been tested for shock attenuation under ASTM-F-1292 and HIC. 2. Shall have been tested for non slip characteristics under ASTM-E303. 3. Shall have been tested for ease of ignition under BS-5696 and ASTM-D-2859. 4. Shall have been tested for fire resistance under UL94. 2.03 MIXING AND PREPARATION: A. Mixture of binder/EPDM or binder/SBR will be determined by the system which is specified. Check VITRITURF Application Manual for specific detailing. A. Prior to application of VITRITURF System the Substrates shall be examined for compliance with the contract documents of VITRITURF specifications. The General Contractor and Architect shall be advised of all discrepancies. Work shall not proceed until unsatisfactory conditions are corrected. 1. VITRITURF Primer Apply primer with a short nap roller at a rate of 300 sq. ft. per gallon. a. Mix SBR to Binder in a ratio of 82/18 b. Spread evenly at specified thickness. c. Compact and allow to dry for a minimum of 24 hours. a. Mix Rubber Grout to SE Binder. Squeegee apply with edge of steel trowel. 1. For compacting: Lubricate trowel with diesel fuel or soapy water. 2. For finishing: Spray a light mist of water on surface and trowel smooth. 3. Apply at a minimum of 3/8″.